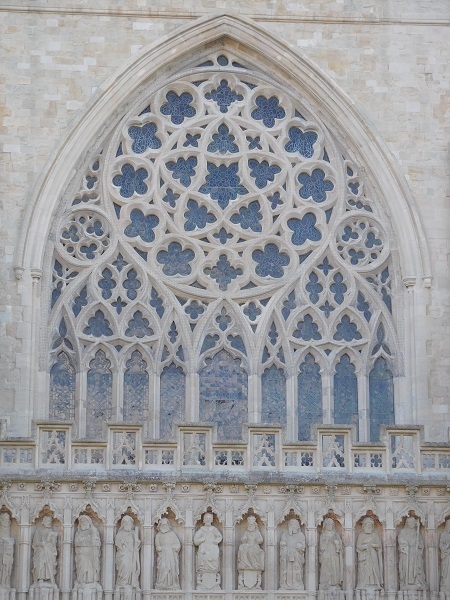 Cathedral Yard – Exeter, Devon. 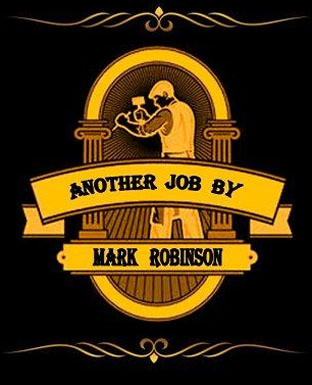 Client : Urbn Construction Ltd. 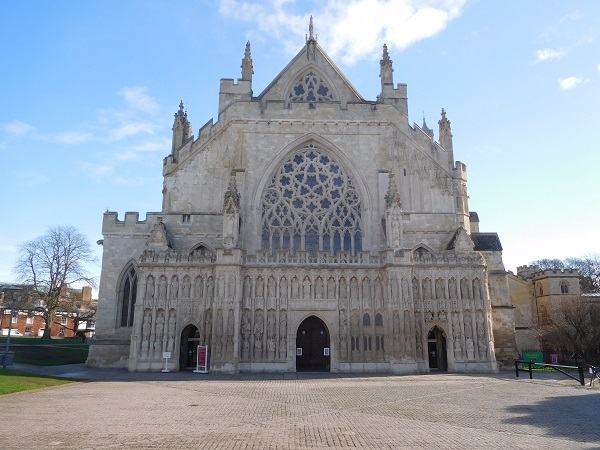 This area had always been the centre of Exeter since the times of the Romans where they had built a basilica and a bath house, but the magnificent Exeter Cathedral started its life when it was founded in the year 1050 A.D. and by 1400 it was more or less complete. 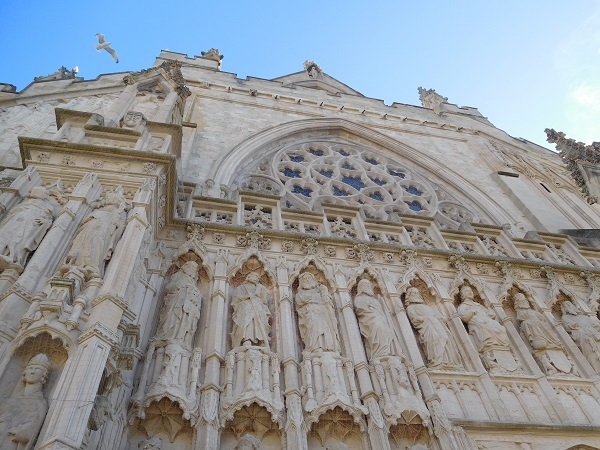 The screen on the front elevation contains England’s biggest façade of 14th century statuary. 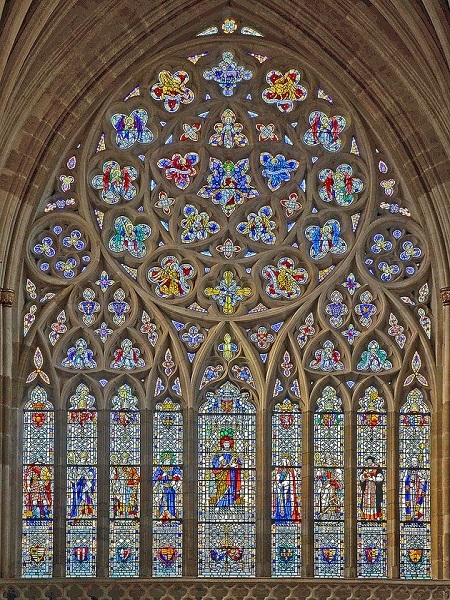 Above that you’ll find the Great West Window which was created by William Peckitt of York, who was the leading glass-painter of his day. It was completed in 1767 . 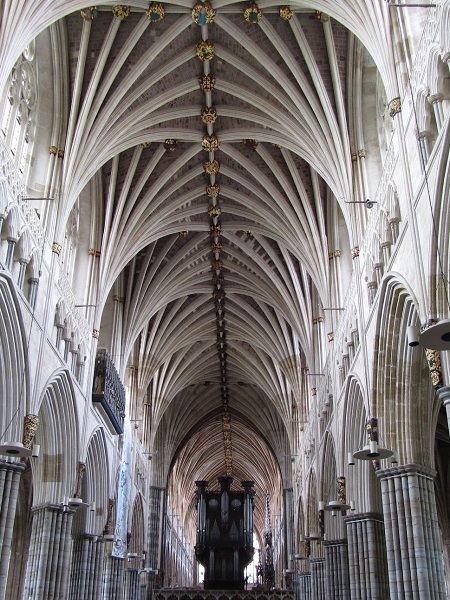 Built entirely of local stone, it has the longest uninterrupted vaulted Medieval ceiling in the world. Opposite on the North-Western side of the Cathedral Green is Cathedral Yard. At No. 23 is the Edinburgh Woollen Mill. Urbn Construction Ltd had recently carried out a major re-development above the shop to create seven luxury apartments. 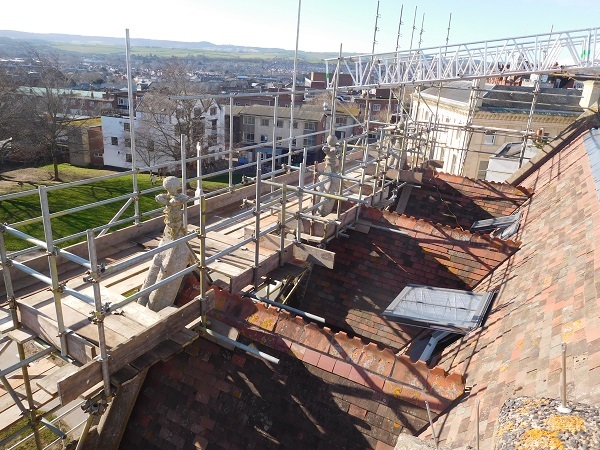 Before the outside scaffold could be taken down, they were concerned about three of the finials that formed the apex to the top of the gables overlooking the Cathedral Green. These proved to be loose and Urbn Construction Ltd wanted us to stabilize them. 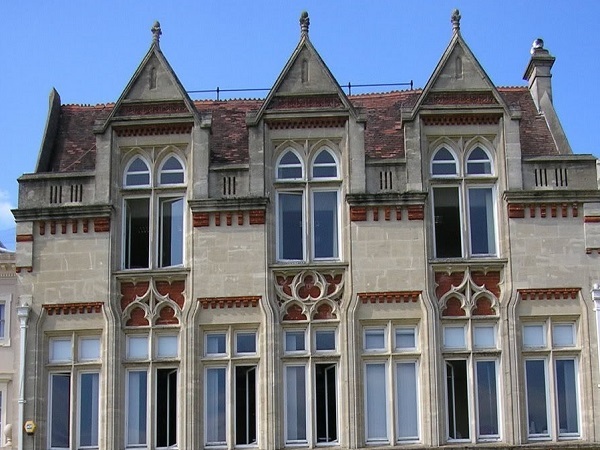 Built around 1884 its architecture is styled on ‘Gothic Revival’. 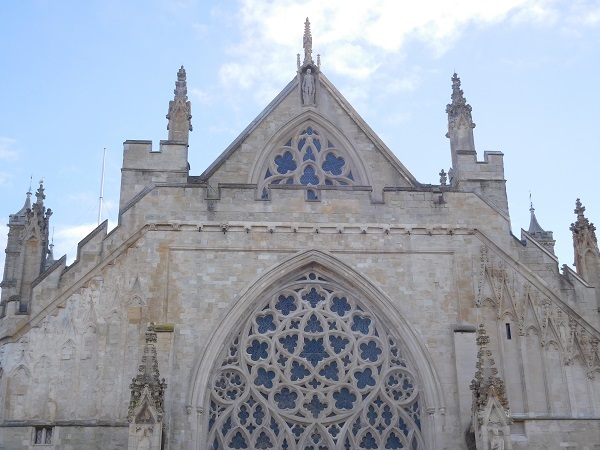 Constructed from Bath stone and red brick, it was built for Whippels, a company that had gained a good reputation for making high quality ecclesiastical fixtures and furnishings, that included stained glass, candlesticks and even clerical robes. This building was not only going to be their shop but also offices, factory and workshops to produce their goods. It is most likely that in 1420 this plot was once the location of a Medieval mansion house belonging to a Robert Wilford who was a wealthy importer of ‘woad’, a plant from which blue dye is extracted. 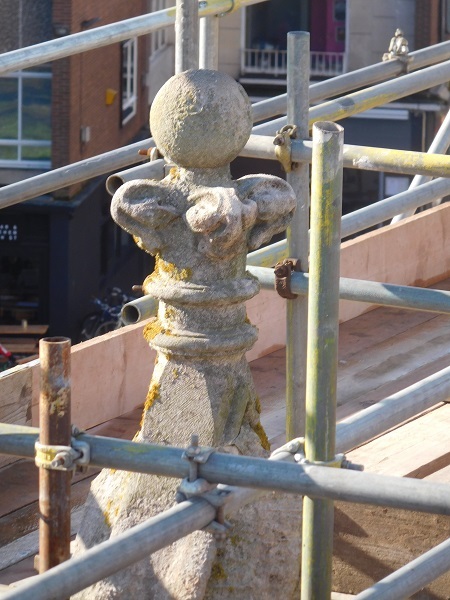 The finials on top of the gables, although loose, didn’t pose much of a risk of toppling over. But just to be safe they were drilled and stainless steel dowels were inserted and grouted with epoxy to stabilize them. 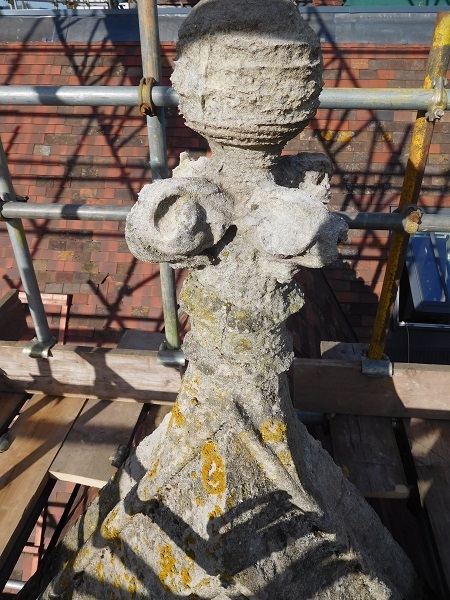 The drill holes were then filled with a Bath stone repair mortar and any joints were re-pointed to prevent the ingress of water. Inside the building as you come down one of the internal staircases there are some lovely stained glass windows. 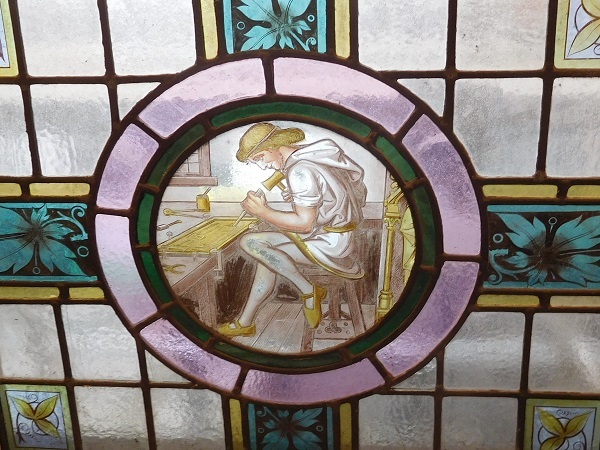 They depict Medieval tradesmen consisting of a stonemason, a tapestry weaver, a carpenter, a church furniture maker, a draughtsman, a metal worker and an engraver. This one is the furniture maker. And this chap is the engraver. 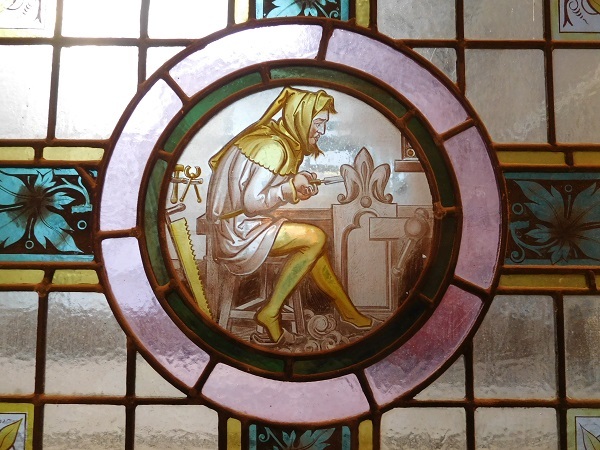 These stained glass windows were most likely made by Whippels to promote their business.